SLICE and DICE LIKE a PRO! SAY YES TO SAFE SLICING! take control of your knives! There are over 1 million yearly emergency room visits as a result from kitchen injuries in the US alone. The majority of these injuries are from knives. The thumb is the most commonly cut digit on your hand. Wether you are a professional chef or a novice in the kitchen, every time you grab a knife you are putting your thumb at risk. 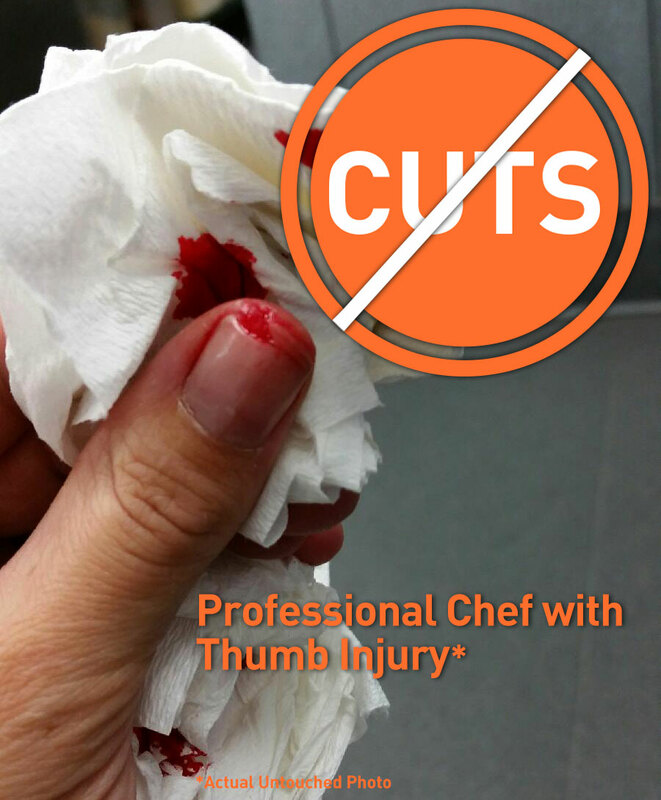 But the Chef's Thumb® prevents needless injuries and lets you take control. 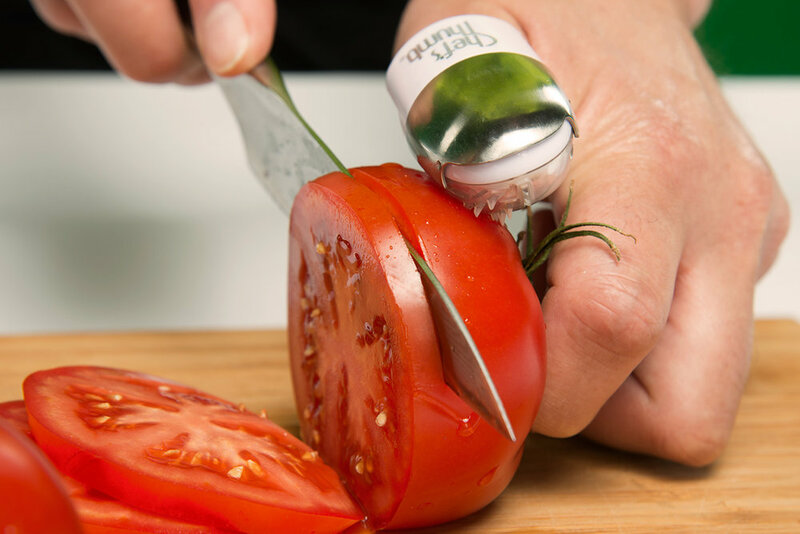 The Chef's thumb is ergonomically shaped and designed to fit almost every thumb size. It is not a cumbersome, gimmicky device to do away with traditional kitchen slicing and chopping procedures, but rather a precision crafted tool designed to make your kitchen knives safer and more efficient. Never fumble a slippery onion or potato again! Stop destroying and wasting produce! Never worry about a zucchini slipping again! 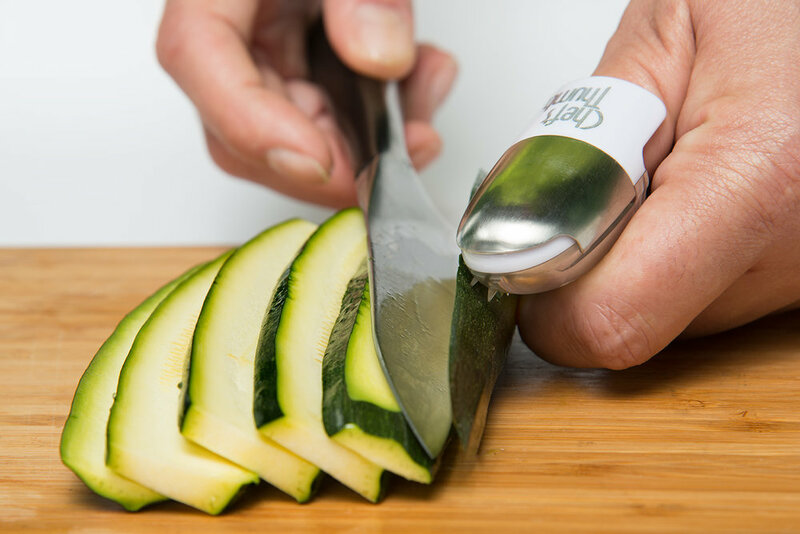 The Chef's Thumb® is the Revolutionary, Gripper, Protector, and Peeler! The Chef's Thumb® is the latest break through in kitchen essentials. It's Viper-Bite® system was scientifically designed to grip and stabilize the cutting surface, while providing protection for your thumb if the knife should slip. It is ergonomically shaped, and its patented design ensures a precise fit for virtually every thumb size. 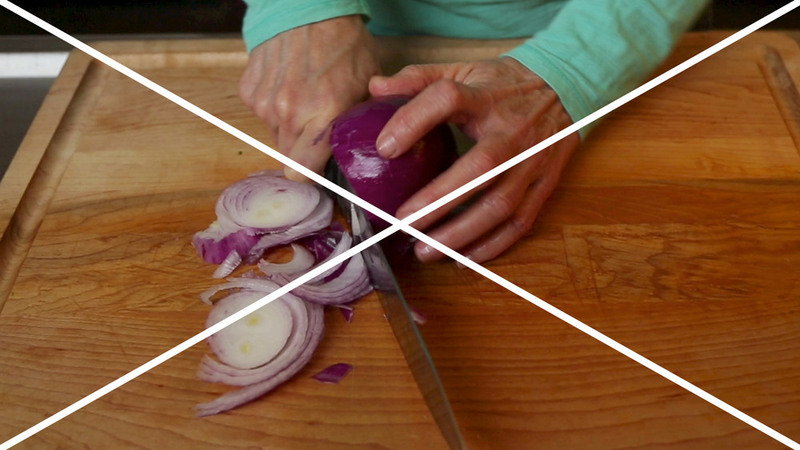 Now you can safely and easily slice right to the end of that Onion or Tomato. Never has slicing Zucchini for the BBQ been so easy. Peeling Potatoes is a breeze with the Chef's Thumb. Viper Bite ensures a slippery potato will never slip, all while protecting your thumb from a nasty peeler gash. Works equally great for paring too! Get right to the end of that onion! Slice right to the end with no waste! Perfect slices for the BBQ every-time! Go from protector to peeler in seconds! 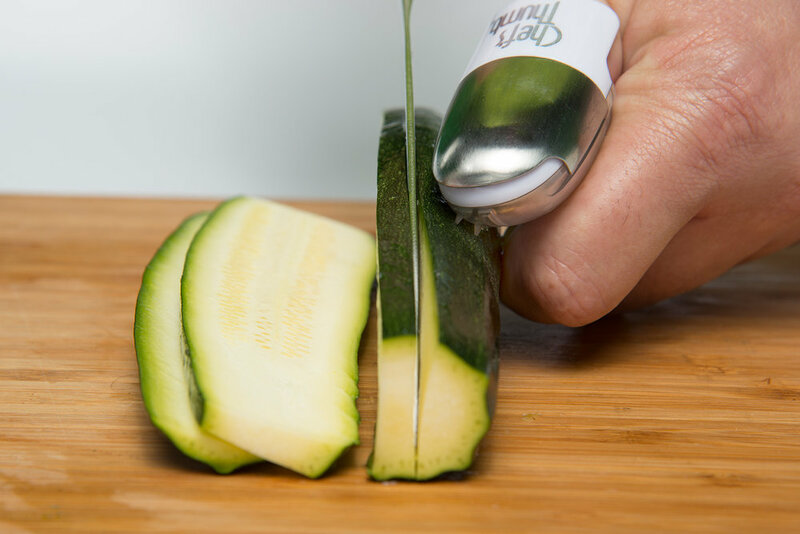 Slide the Thumb Touch® peeler into place, and the Chef's Thumb® transforms into a light duty, high efficiency peeler. Now peel effortlessly and efficiently at the same time. Triple bonded Titanium T3™ Blade never rusts and stays sharp forever. Perfect for quick peeling jobs where a heavy duty peeler isn't necessary.